“Risk” is a scary word for many. Stepping out of your comfort zone and taking a chance on something that might or might not work out can cause some to continue with the status quo. But taking a risk, as frightening as it might be, can open you up to new opportunities, better decisions and, perhaps, a more fulfilling career. 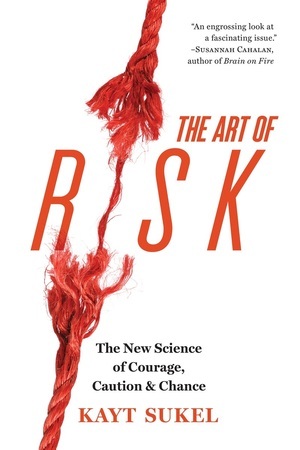 In the book, Sukel interviews scientists, extreme athletes, an entrepreneur, an Army Special Forces operator, and a neurosurgeon, among others, to learn more about how they look at the world – and how they make risk work for them. We often talk about risk as if it’s the stuff of superheroes or criminals, but risk really just is a decision-making process. I think we’re so scared of it because we discuss it in extremes – risk is going to bring us all the glory or bankrupt/injure/kill us. But simply stated, risk is just a decision where there is an uncertain outcome, and that outcome may be negative. Each and every one of us is taking risks every single day, whether we are brokering huge biz deals or just deciding whether or not to have a third cup of coffee in the morning. It comes down to dealing with uncertainty. Some of us are more comfortable with it. In reality, we’re all risk-takers. I’d say that’s accurate. And being prepared so you can have a good idea of what those outcomes might be. It’s funny – most successful risk-takers will tell you they are not risk-takers! But they don’t see their decisions as scary/hard/beyond them because they are only considering residual risk. It’s being thoughtful, prepared, being able to emotionally regulate. It’s understanding that the brain has its own shortcuts for dealing with uncertainty and working with it. As I wrote in “The Art of Risk,” I spoke with a lot of successful risk-takers from a variety of domains, and it amazed me that, despite their area of expertise, they approached risk in very similar ways. They know their area, whether it’s firefighting or surgery, inside out. They can reduce uncertainty. We don’t see all the work that goes into their decisions – only the outcome. No! They are just really practiced and prepared. Successful risk-taking really is open to all of us. The only difference is that they know their domain inside/out. So they differ in experience – it confers advantages. That brain surgeon? He might think writers are the real risk-takers for not having a regular paycheck/benefits. Risk, to a large extent, is in the eye of the beholder. That’s the great thing about risk being a process – it means we can all harness it to meet our long-term goals. Some of us are more comfortable with intensity, fear, stress – but we can all learn how to better deal with risk. Each of us takes risks, every single day. We often make risk bigger and badder than it needs to be. Writing, like any art or small business, involves a lot of uncertainty. You have to come up with new angles for stories, find the right outlets, juggle money and time. It requires working at the edge – and not knowing what you’re doing (or when you’ll be paid) from month to month. To write great stories, you need to take risks on new perspectives. Make yourself stand out. And to succeed as a business, you need to try to move with the industry, which is never predictable. Writers, truly, are some of the riskiest people I know. And it’s what gives them voice and verve. If you can’t handle the uncertainty of random paychecks or new ways to consider the world, you’ll have a hard time. It’s helped me reframe stories and take a new point of view. It’s taught me that being passionate about what I’m writing can be equally as important to what I’m paid. It’s taught me that the best stories are ones where you find a way to get out of your comfort zone and really learn. Uncertainty isn’t necessarily a bad thing. It offers just as much opportunity as danger. And so I’m doing my best to harness those opportunities, learn what I can in the process to become a better writer. Not everything will work out, of course, but where it doesn’t, I can learn something that will help me later. I’m not supposed to be a writer, let alone have written two books. Writing that first book proposal was a long shot. It was a huge risk – but, in the end, worth it. I really reach out to new and different sources for stories. I’m not afraid to ask. Sure, a lot of high-profile people may say no (or just ignore your request), but a lot more than you think will say yes. Yes, and that’s what I found so inspiring about risk. I started the book thinking I was going to look at superheroes. I ended up learning about everyday life. Risk is part and parcel of every single decision you make, every single day. When you become more accustomed to risk, you can see the opportunity beyond the danger – and move towards your goals. Little risks – smart, seasoned risks – can have extremely large payouts in all aspects of life. What’s your best piece of advice for anyone who – like yours truly! – is leery of taking risks? What about the fear that you’re making the wrong decision? How do successful risk-takers get past that? Successful risk-takers make mistakes all the time. But they use them to learn. One of the people I interviewed told me she doesn’t fail, she “just hasn’t finished yet.” I really want to stitch that on a throw pillow. Imagine what we all might accomplish if we thought in a similar way! We’d learn a lot about how to move forward towards our goals, how to do things better. We have to accept that we will decide unwisely from time to time. Even the smartest and shiniest of us. So we need to better place ourselves to learn from those mistakes and move forward the next time around. Risk really is part and parcel of everyday decision-making. The more we accept it, the better our decisions will be. In work, in life, in love, in play – risk is there. You can either fear it, or make it work for you. I’m taking a big risk myself this summer – I’m starting a fiction project. I’ve always wanted to try it. But I was scared. And there is no reason to be. I may not succeed at it, but there is a lot to learn in the process. So even if I don’t write a bestseller, I’ll gain new tools that will help my non-fiction writing.